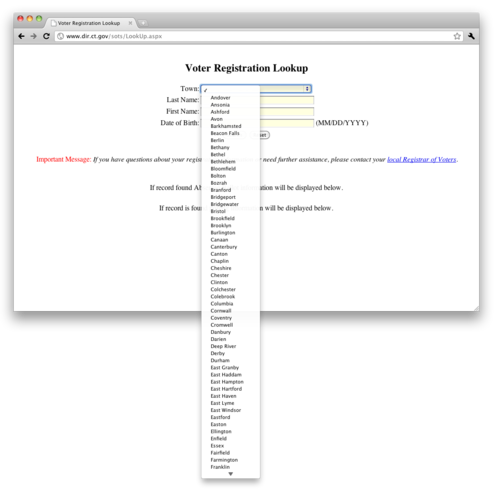 There are 169 recognized voting municipalities in Connecticut, and 22 of them start with “W”—that means a lot of user time wasted scrolling through this enormous drop-down menu. Setting up a separate search for town name isn’t too tough, but that would increase server load (and not be fun since it’d probably have to be done in ASP). A text field with dynamic autocomplete suggestions built on jquery would be my preferred fix. A brief look at the page source reveals how each town name is linked to an integer value; maybe I’ll code this as a service to the State of Connecticut later today if the voting lines aren’t too long.